Chef Dean James Max brings us A Life by the Sea: Modern American Seafood. What I would deem “modern and American” is something not necessarily simple, but straight-forward and down-to-earth. 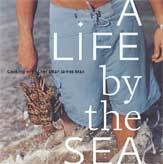 This is how I would describe not only A Life by the Sea but the man himself as well. After having obtained a bachelor of science in marketing and a minor in hotel and restaurant management, Chef Max went to Florence, Italy and found his passion for cooking. His experience there along with training in French Cuisine soon led him to be part owner of Atlanta’s popular Mumbo Jumbo Restaurant and finally to 3030 Ocean in Fort Lauderdale, Florida. And please, don’t misinterpret simple and straight-forward as boring, I mean quite the contrary. The recipes together with the photographs by Quentin Bacon that bring the dishes to life make me want to go to the nearest fish market and start cooking! What I would call a “seafood” version of an amuse-bouche is the Soup Shots of Nantucket Scallops. Instead of serving this appetizer in a spoon or a very small bowl, it is served in the half-shells. Now, I’ve heard of a vodka-pasta sauce before but not vodka-beet vinaigrette. Thus the reason I mention here the Columbia River Sturgeon recipe where sturgeon meets thyme, shallots, caviar and of course, vodka-beet vinaigrette. Finally, no seafood book would be complete without an Maine Lobster Bisque with Fennel, Leeks, and Tarragon recipe. Of course, the addition of cognac doesn’t hurt either.